A best-selling Alabama novelist who spoke at Bevill Hall Auditorium in Jasper Tuesday said after his grandfather told him he shouldn’t expect to make a dime as a writer, he set out to prove the man who raised him wrong. Robert R. McCammon, the author best known for his 1991 effort Boy’s Life, already knew better. He’d won $10 for a war story he wrote for a contest at Banks High School in Birmingham. Even then, the author whose books are often categorized in the horror genre, had a taste for the macabre. The story involved a leech attached to a dying soldier that begins to talk to the Vietnam serviceman. McCammon got more proof he could be a successful writer during a high school speech class when he captivated his classmates by reading aloud another grim yarn — this one about a spirit that causes the people it preys upon to kill themselves. 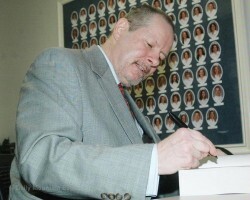 Despite his early success, McCammon found that becoming a writer was not going to be easy when he was unable to get a reporter position after graduating from the University of Alabama in 1974 with a bachelor’s degree in journalism. McCammon had decided to pursue a writing career despite his grandfather’s desire to have him join the family furniture store business. “When I got out of college I couldn’t find a job because it was during ‘All the President’s Men’ when lots of people wanted to be journalists,” the 57-year-old author said about the autobiography by Carl Bernstein and Bob Woodward about how the reporters uncovered the details of the Watergate scandal that led to the resignation of President Richard Nixon. 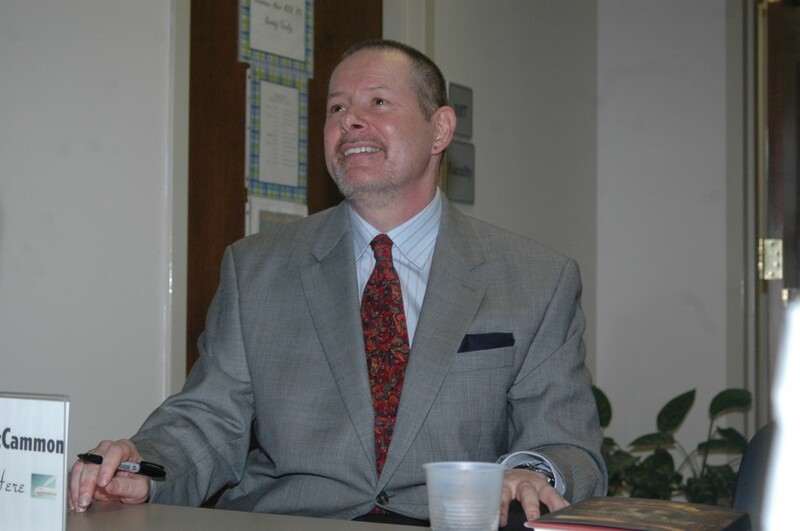 Eager to break into the field, McCammon said he approached another writer who was featured in Read Alabama!, a program that each year brings state authors to speak at the Jasper campus of Bevill State Community College. “I was so desperate that I called Kathryn Windham Tucker and passed myself off as a writer for People magazine,” he said. McCammon revealed a penchant for comedy Tuesday when he talked about the startle he received at the home of Windham, who is known to live with a ghost she calls Jeffrey. Finally, McCammon got a job as a copy editor at the Birmingham Post-Herald. One day he went into the city editor’s office armed with a batch of feature columns he’d written in an effort to get published. McCammon said the editor — who told the author his words would never be published in the Post-Herald as long as he was in charge — was not unlike other “obstructionists” he met throughout his literary path. McCammon said these naysayers are often revealed through their body language. “I’ve met many people who are obstructionists — the people who sit and lace their hands behind their neck and lean back in their chair and survey the room — and say ‘no’ because they can say no,” McCammon said. 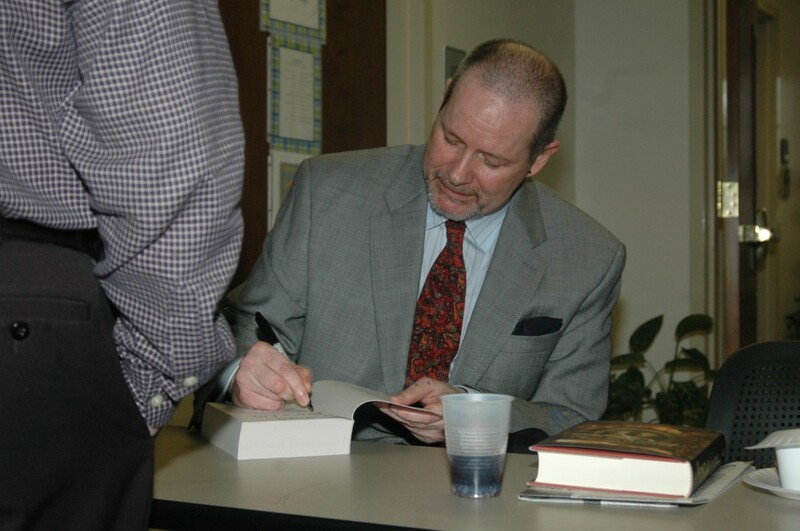 Although McCammon struggled to get an article published in the newspaper that went out of business in 2005, he had better fortune in getting into print his first novel, Baal, which was published in 1978. Having an imagination similar to King worked in McCammon’s favor until he decided to break out of the mold he was pushed into by the publishing industry. 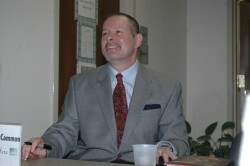 Because his publisher, Pocket Books, lacked the enthusiasm McCammon had for Boy’s Life, he said he threatened to break his contract with the company. Fearful of losing their scribe, the company gave up efforts to make changes to the book in an effort to make it more successful. Although it wasn’t the first time marketing department executives had tried to force him to make his stories more commercially viable, McCammon said it was his company’s attitude toward Boy’s Life that ruined his relationship with his publisher. “You know — something about my relationship with Pocket died,” McCammon said. Boy’s Life which has gone on to become a literature class staple in schools across the country, eventually would win the 1991 Bram Stoker Award, which McCammon had won with his previous published work, Mine. McCammon said winning the literary award didn’t compare to learning that a recently deceased man was such a fan of Boy’s Life that he had a copy of the coming-of-age novel set in Alabama buried with him. “What more can a writer ask for than to accompany someone on their final journey?” he asked his audience Tuesday. After McCammon’s follow-up to Boy’s Life a book titled Gone South, McCammon decided he was fed up with the publishing business. “For eight years or so, I didn’t write a word,” McCammon said. When Film director Frank Durabont, (The Shawshank Redemption) approached McCammon about his desire to write a film adaptation of Mine, the writer decided it was time to return to his craft. However, this time around, McCammon decided he was not going to imitate anybody. Because it was so different from most of his other work, Speaks the Nightbird, a book set in colonial America, made his publisher nervous. “People in publishing get very nervous when there is no model to base your book upon,” he said. For his next book, Queen of Bedlam McCammon chose to continue the adventures of Matthew Corbett, the young detective at the center of Speaks the Nightbird. In January, the series continued with the third installment of the Matthew Corbett saga, Mister Slaughter, which was recently nominated for an American Library Association Award. Other novels written by McCammon include Usher’s Passing, the winner of the Alabama Library Association Alabama Author Award; Swan Song, a co-winner of the 1987 Bram Stoker Award; and Stinger, which was nominated for the 1988 Bram Stoker Award, a prize created by the Horror Writers Association that is named for the author of Dracula. While on vacation with his wife, Sally Sanders, and daughter, Skye, years ago, McCammon got a phone call from his agent that affirmed his success. The agent called to tell McCammon that a publisher had offered him $60,000 for a two-book deal. It was then that McCammon fully comprehended that he had succeeded in proving his grandfather, Robert C. Bundy, wrong. “I realized I was really a writer,” he said. McCammon said he turned to writing as a means of getting away from a pugnacious household. “I needed a way to escape that incessant arguing, screaming and bad vibes,” he said. McCammon ended his lecture with advice for others who aspire to be writers. “Get ready for a long, long battle, but don’t give up the fight, because it’s worth winning,” he said, adding that writers have to keep believing in themselves — even when naysayers try to steal their confidence. Copyright © 2010 by Daily Mountain Eagle. All rights reserved. Reprinted with permission of the author.